- "This bibliography, originally created for a panel discussion at a regional conference in Wisconsin, has grown with the increasing number of documents which address the problems and issues related to teaching and using critical thinking skills to evaluate Internet resources." - "This document discusses the criteria by which scholars in most fields evaluate print information, and shows how the same criteria can be used to assess information found on the Internet." - Guideline for evaluating documents. 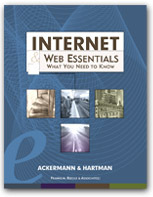 "It is important to remember that anyone can publish on the World Wide Web. This means that the quality of the information you find on the Web must be evaluated very carefully."